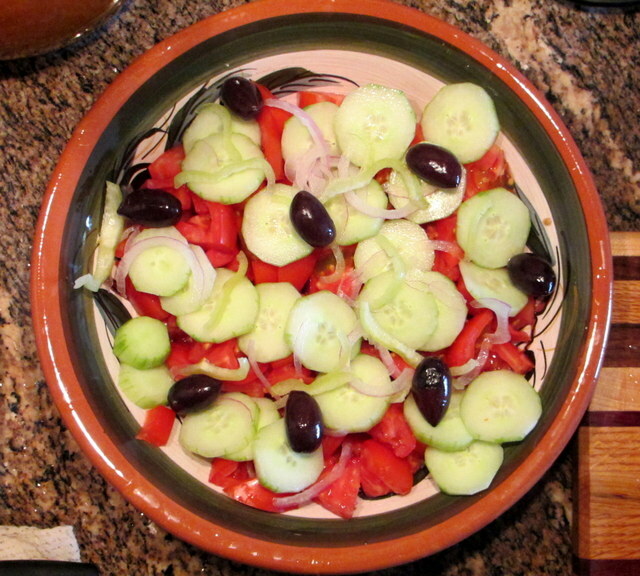 OK, it’s not an ode but it is a Grecian salad. Horiatiki, thy name alone inspires reverence and appetite. 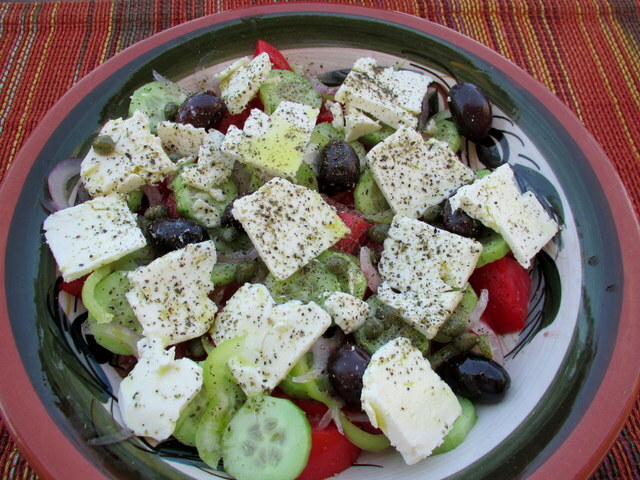 Horiatiki salata is the quintessential Greek salad, the salad that is ambrosia in the home country and an embarrassing, pale imitation in the US. 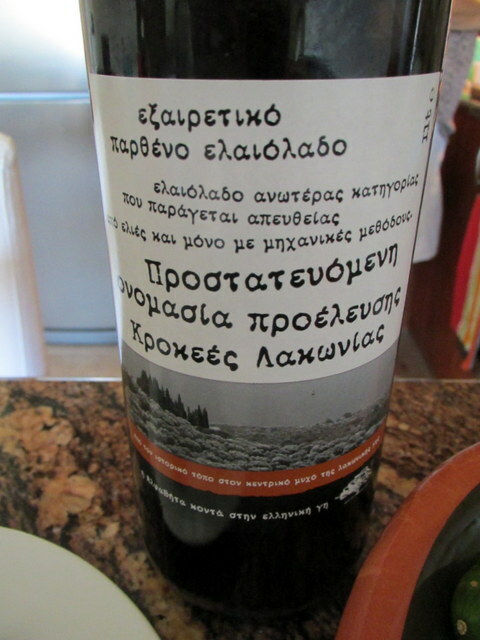 “Horiatiki” means “village style,” which in turn means simple, fresh, unadorned. 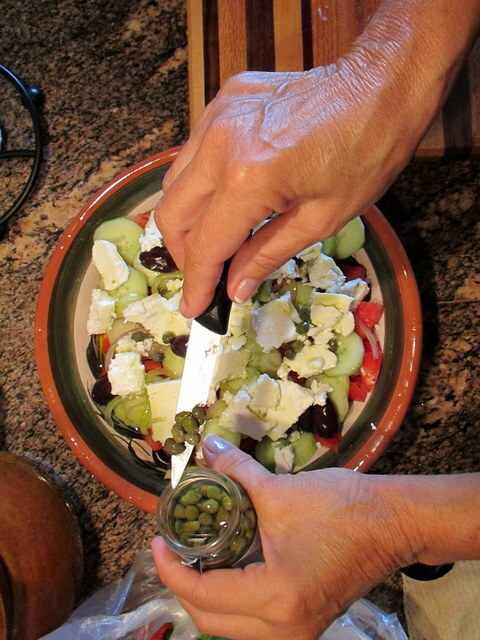 To make a good, true Horiatiki salad, the vegetables must be in season and very fresh, the feta must be Greek and served in a single large chunk, and the oil must be very good olive oil. An unwillingness to compromise on the vegetables means that Horiatiki is only available here in the summer which, mercifully, is quite long. 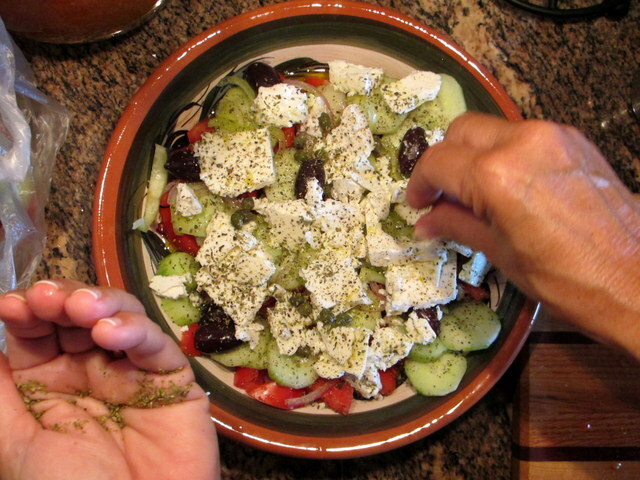 The dreadful “Greek Salad” or “Village Salad” that one finds in most Greek restaurants in the US usually fails on all three counts: the tomatoes are either yellowy or hothouse, the feta is crumbled (a sign of uncertain quality), and the oil is cheap, if it’s not canola. And, if you see leafy green stuff (eg, lettuce) in your Horiatiki, well…your salad is beneath contempt. Now, while I agree that a person whose skill in the kitchen is limited to taking something out of the freezer and putting it in the microwave should not be allowed to promulgate a recipe, my affection for Horiatiki (I’d have it twice a day if a certain someone would let me…) emboldens me to venture into that strange territory. Thanks to the cooperation and patient instruction of my better half, I offer the following pictorial on the proper, God-given, canonical method of preparing this simple, perfect dish. 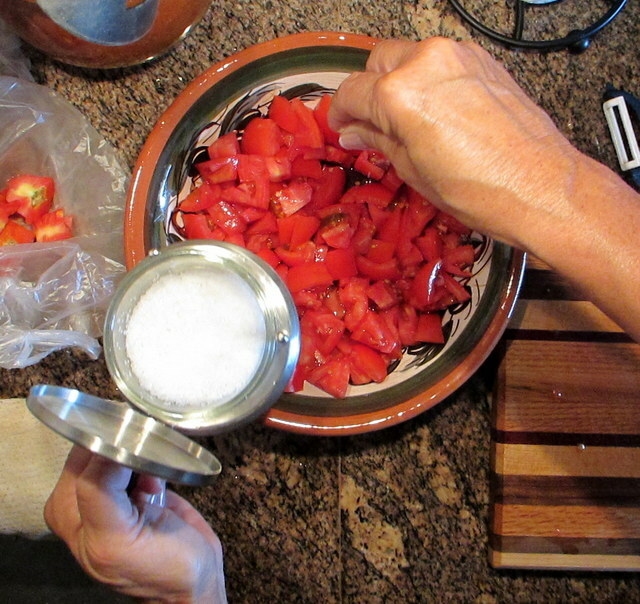 First, go out to your garden and pick a fat, perfectly ripe tomato for each person. If your garden has failed or fails to exist, a good truck farmer can usually supply real fruit but beware the supermarket: plastic, flavorless tomatoes cannot be substituted. The green pepper should also be garden fresh and very mild, and the cucumber should be crisp and peeled. Mildness is also a virtue when it comes to the onion, which can easily overpower everything else. Some people (you know who you are) consider capers optional; I do not. I’ll get to the olives in a bit. 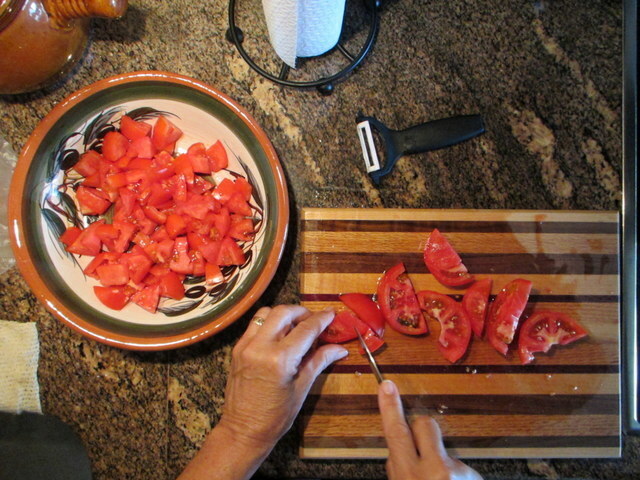 Cut the tomatoes into bite-sized chunks and put them in the salad bowl. Season the tomatoes with sea salt and set aside. Peel and slice as much cucumber as you feel appropriate. Slice a small portion of the onion as thin as possible and cut the rings into quarters (90 degrees of arc for you scientific types). 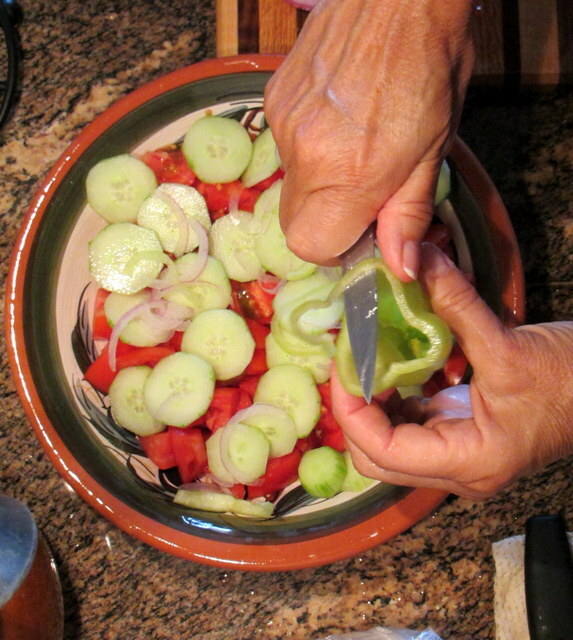 Slice the pepper as thin as the onion, and don’t leave your guests to deal with pepper rings: cut them up. Use enough pepper to serve as a heavy garnish (a quarter of the pepper). 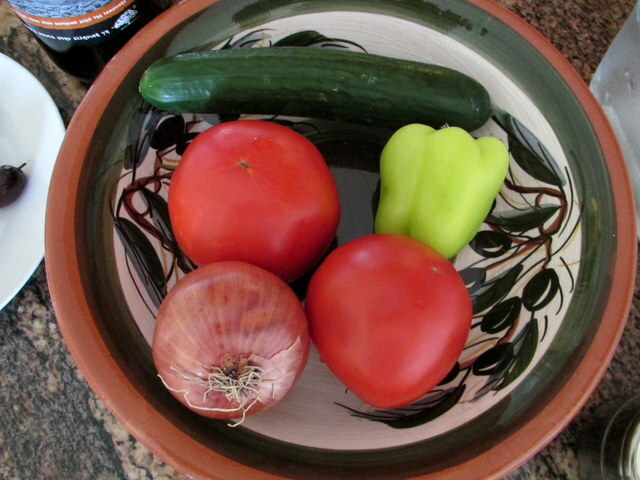 When the tomatoes have had at least 5 minutes with the salt resting on them, layer on the cucumber, onion and pepper. 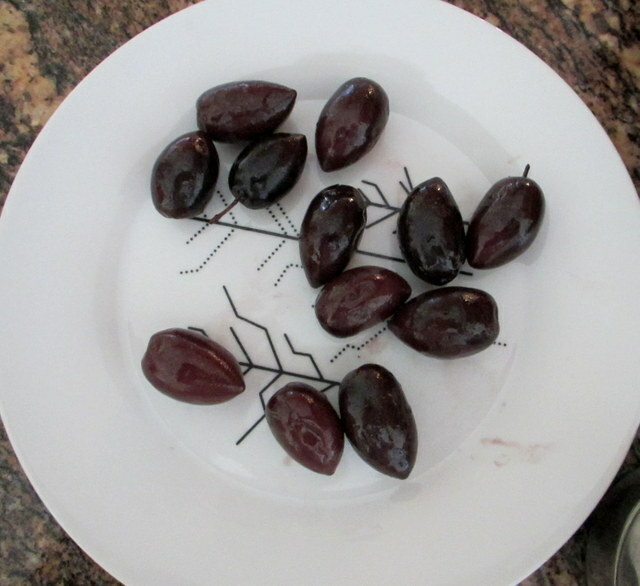 We like 4 or so olives per person but you’ll never get that many in a taverna, so add them as you’d like. Sprinkle on a couple of teaspoons of capers. If you don’t like capers for some odd reason, don’t eat them. But they give an extra dimension of flavor to the salad, and so should always be added. Since you know your feta is of high quality, feel free to slice it into easily spooned slices, as we do, or do it the way all tavernas do and just lay a huge block artfully on top. 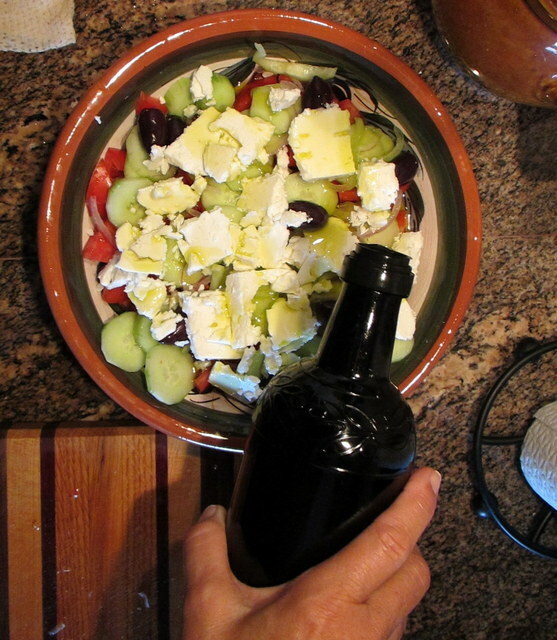 Drizzle the olive oil liberally over the salad. For some of us (who shall remain nameless), the whole point of a Horiatiki salata is the creation of the amazing tomato juice/olive oil melanage in the bottom of the bowl, which can be best appreciated when soaked up with piece of really nice, crusty, fresh bread. So skimping on olive oil misses half the goodness. Finally, sprinkle some dried oregano evenly over the entire bowl. I don’t know what kinds of dried oregano are available in the States but the kind we get here is wild oregano, gathered in the mountains and air dried. Its taste is head-and-shoulders beyond the stuff in the McCormick’s jars, so if you can find some kind of dried oregano with an expressed provenance, give it a try. Add some freshly ground black pepper to finish the salata. Your Horiatiki is now completed. I think it’s best when slightly chilled, so if you have a few minutes to hold it in the fridge, I’d do it. Regardless, when it’s time to eat, carry your Horiatiki to the table but do not mix it. 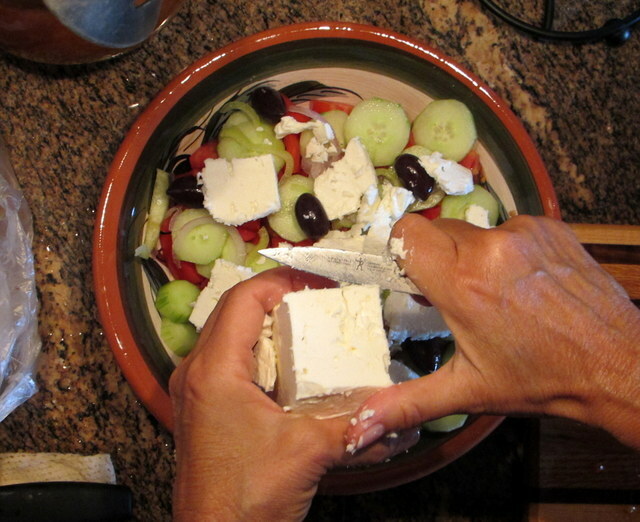 If the feta is in a block, break it into pieces at the table and back away. Oriste, your Horiatiki is ready to serve. Serve it by spooning it up from the bottom — this way everyone will get all the layers, covered in olive oil. 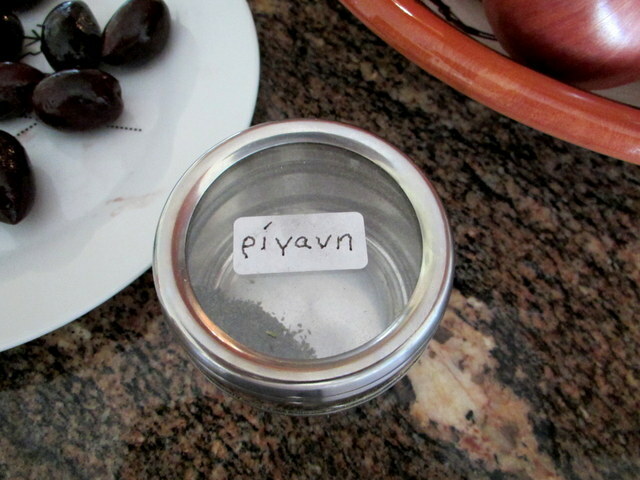 On the matter of seconds: in Greek families it is accepted that everyone simply eats seconds out of the bowl, including swiping away at the olive oil with hunks of bread. If you’re dining with family or close friends, and this kind of communal dish is acceptable, it’s recommended for the intimacy it brings to meal. Otherwise, the traditional passing-of-the-bowl works just fine. That’s it. Accept no substitutes. Consume outdoors if at all possible. A crisp white wine is a wonderful addition and a hoppy summer beer is sublime. And a tableside view of a Grecian sea is best of all. Thanks to Andrew, who stands second to no man in his affection for Horiatiki, for suggesting this post.